Electronic Circuit Design Service needed? We do complex circuit designs! Complex Electronic Circuits Designed with ease. Get your quote now! Why choose TronicsZone for Electronic Circuit Design? TronicsZone is an electronics design firm that provides design and manufacturing services to customers who wish to outsource the designing, simulation and manufacturing processes of their required products to achieve higher quality at lower fabrication costs. At TronicsZone, we believe in getting things right the first time over. Every design is thoroughly studied, thought through and passed through an extensive set of tests to ensure maximum fault detection. This exhaustive checking and testing removes the risk of device and design failure by many folds, saving both precious time and money. The designs that pass the painful iterations and succeed in performing well under rigorous testing conditions are taken onto production. We build prototypes for your required design only once the design has passed the testing stages, has been modified as per requirement and proven error free for the most part. Prototyping is crucial to ensure that the product does in-fact serve the purpose it is intended for. They are often built using cheaper raw material just to get a vague idea of how the feasibility of the finished design. Once the prototype has been tested on multiple fronts for performance and analyzed meticulously, only then is the finished product taken up for larger production runs. Over the course of 16 years, TronicsZone has developed over 200 electronic designs, from fairly simple to highly complex. TronicsZone has now extensive experience in the field of electronic design, simulation, prototyping and manufacturing. These designs begin their journey as mere concepts and are carried to completion. Based in India, TronicsZone customers can expect immediate, effectual and high quality service owing to the huge talent pool and low operational costs. An electronic circuit is made up of different components such as diodes, resistors, transistors, and capacitors, connected to each other by means of a wire. Initially, the electronic circuit is initially designed using a breadboard for prototyping. This makes it easier for the designer to make modifications and and improvements in the circuit. These electronic circuits have a wide range of application, from data transfer and signal amplifications to computation. 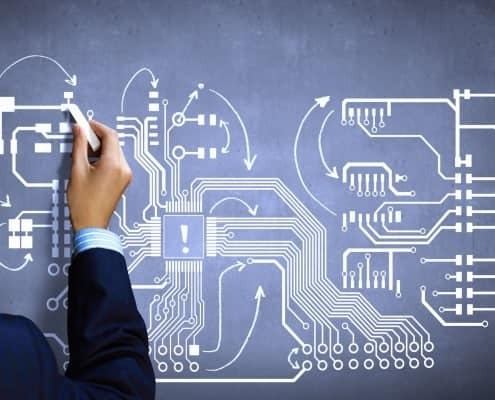 Previously, the components of an electronic circuit were connected to each other through a wire, now however, they are soldered on the printed circuit board (PCB) to interconnections. Before the invention of integrated circuits (ICs), each individual component of the circuit i.e. diodes, transistors, capacitors, inductors and resistors were of a discrete nature. Now, however, each electronic device is designed and manufactured as a single unit. In order to understand the fundamentals of electronic circuit design, it is necessary to become familiar with the components of the system. An analogue electronic circuit design is that in voltage or current varies with time. Transistors, capacitors, resistors, diodes and wires are the basic constituents of an analog circuit. Electrical signals in such circuits are continuous and can be represented using schematic diagrams in which wires are represented as lines and a unique symbol denotes each component. Every analog circuit design consists of parallel or series, or both circuits. A digital electronic circuit measures electrical signals a discrete values. The data in digital circuits is represented as binary digits. Digital circuits largely consist of transistors in interconnection to create logic gates and can perform calculations. The various components and interconnections in an electronic circuit are represented using a schematic circuit diagram that makes use of standardized symbols for each component. These diagrams help to design, construct and optimize the electronic devices. The electronic circuit switch is an electrical device that is used to discontinue or turn off the flow of current in the circuit. When designing analog or digital circuits, one should easily be capable of predicting the current and voltage values at each node with in the circuit. Simple non-linear and linear circuits are analyzed by hand through mathematical computations, whereas the use of software is required to perform analysis of the complex circuits. The use of simulation software makes designing circuits more effectively possible, reducing the cost, time and risk involved in actually manufacturing the circuit prototypes. The electronic circuit simulator is a software that utilizes mathematical models to predict, replicate and analyze the nature of an electronic circuit, removing limitations imposed by expensive tools such as photomasks for ICs. SPICE is the simulation software used for designing analog circuits, whereas Verilog and VHDL are mostly used for digital circuit simulations.